The title was my husband's idea because I couldn't think of one. He said, "Cashew ... Gesundheit" and that made me laugh. So there you go. 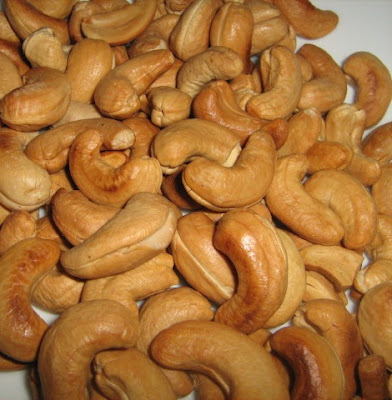 The other day I roasted organic raw cashews. Have you tried this? It's my favorite way to eat cashews. Makes the house smell yummy and once cooled, the cashews are wonderful. Preheat oven and bake on clean cookie sheet for 7 to 10 minutes (or until done). Keep a close eye as not to burn. Yummers. I like to dry fry raw nuts in a pan with a tiny bit of oil, salt, pepper and chilli flakes. Be careful of your eyes though! Hi Elaine: Peanut soup? I never had that. Sounds interesting though. I love to roast raw peanuts and then make homemade peanut butter. So good. MG: Hi, I have not had a pine nut in so long, that I've honestly forgotten what they taste like. Dungeonmum: Hello to you. I've done brown sugar and butter in a skillet but never a spicy skillet nut. I must try that, as I get these one nuts that are hot and whew, they are good. Thanks for the idea on making my own. Milo: Glad it makes you hungry. How is your writing going? Well, I hope. Thanks everyone for stopping by. Time for me to unpack groceries and get to the rest of my day.